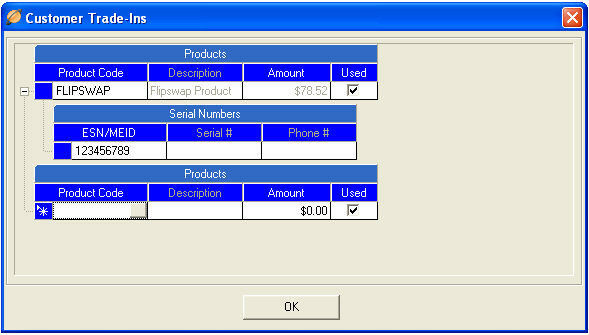 Note: If you have not completed the setup for Flipswap please review the Setup help file . 2. Create or Select a Customer. 3. On the General Tab Select Trade-In from the right hand side. 4. Click the Product Code lookup box. 6. Select the Manufacturer and Model of the phone being traded and click OK.
8. Check the box for any accessories brought in with the phone. 9. Enter the IMEI/ESN number (and a reference number for your tracking purposes, if desired) and click Next. 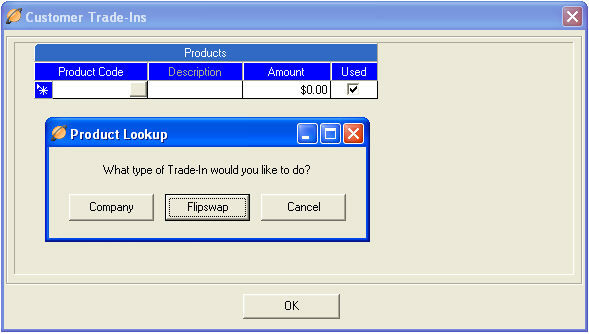 10. Review the information populated on the Customer Trade-Ins screen and select OK.
11. Enter the customers purchases (may be done before or after entering the Trade-In) and complete the sale normally.